Loretta Lynch To Be Nominated As Next U.S. Attorney General : The Two-Way A lead federal prosecutor in New York City, Lynch will be introduced by President Obama at the White House on Saturday. Her office has handled old-school Mafia busts, cutting edge cybercrime and more. Loretta Lynch, a lead federal prosecutor in Brooklyn, will be announced as President Obama's choice for attorney general Saturday. President Obama will announce his choice of U.S. Attorney Loretta Lynch as the next U.S. Attorney General this weekend, the White House says. 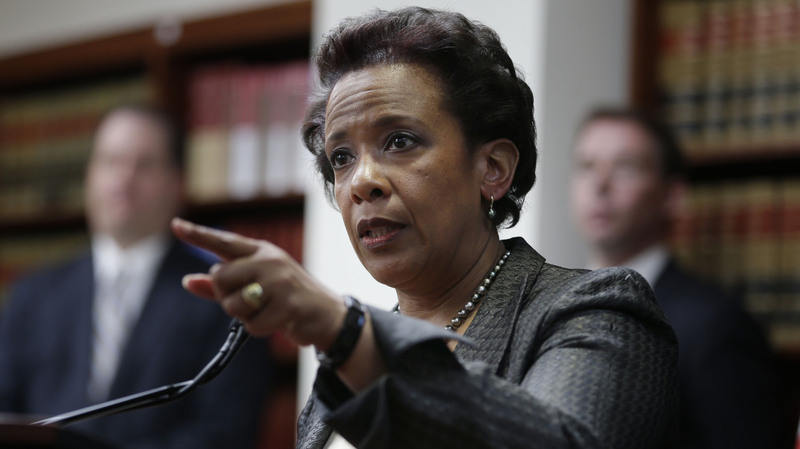 The president will formally announce his intention to nominate Lynch Saturday. Lynch, whom the White House describes as "a strong, independent prosecutor who has twice led one of the most important U.S. Attorney's Offices in the country," will be introduced at the White House Saturday, alongside current Attorney General Eric Holder. The plan comes after NPR's Carrie Johnson reported Thursday that Lynch, a lead federal prosecutor in New York City, could be nominated within days. "Lynch, a graduate of Harvard Law School, worked her way up the ladder in Brooklyn," Carrie said, "a huge office that handles everything from old-school Mafia busts to new forms of cybercrime." "If she's selected by President Obama to lead the Justice Department, Lynch would become the first African-American woman to serve as attorney general. She was born in Greensboro, N.C., in 1959, a year before black students there sat down at a whites-only lunch counter and helped catalyze protests around the country."